How cheap books opened a world of ideas to new readers. In the 1930s, British publisher Allen Lane established Penguin Books, the first line of inexpensive quality paperbacks. That successful venture migrated to the United States under the auspices of New American Library, which took as its logo Signet, alluding to another bird: cygnet, a baby swan. As Rabinowitz (English/Univ. of Minnesota; Black & White & Noir, 2002, etc.) argues in this literary and cultural history, paperbacks became enormously popular from the 1930s to the early ’60s, creating a mass readership for titles that ranged from detective stories to acclaimed works by such writers as Henry James and Thomas Hardy. 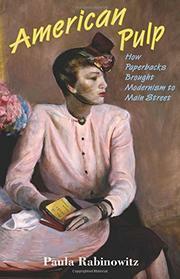 “The mechanism of pulping a work,” Rabinowitz writes, “entailed a process of redistribution or, more precisely, remediation: writings often created for an educated and elite audience took on new lives by being repackaged as cheap paperbacks.” Repackaging included cover illustrations, as well, some with bold depictions of sexuality or violence; others, with modernist art. Rabinowitz makes a persuasive case for the role of pulp in widening the landscape of Americans’ experience. During World War II, paperbacks were distributed to troops, both to boost morale and to “help develop readers from even those with limited education,” a strategy that created postwar demand. Among the most popular paperbacks were crime novels, which explored how “psychological and economic forces…collide in an individual.” Rabinowitz examines in particular the impact of works by two black writers: Richard Wright, whose 12 Million Black Voices (1941) drew upon the genre of true confession magazines; and Ann Petry, whose Country Place (1947) dealt with “malice, calculation, infidelity, adultery, murder, sudden death, and a set of surprise bequests.” The author also considers assorted novels that served as “one of the rare mass avenues open to depicting lesbian relationships. An ardent collector of pulp fiction, Rabinowitz brings to this scholarly study a passion for the genre and an authoritative analysis of its meaning in American culture.